Kathleen Totter received her MA in Ceramics from Kent State University. Totter has participated in numerous workshops in the ceramics, as well as in paper, fiber, sculpture, and computer graphics. A sense of spirituality infuses her Raku, paper, and fiber works. Totter’s deep concern with man’s inability to maintain nature’s virgin forests, water and air has recently become a focus of her work. She senses a spiritual cry from Mother Earth to heal her gaping wounds and to help balance life’s eternal cycle. Using earthy materials, Totter sees a mystical link between man and nature. In executing her handmade paper, Totter uses the Oriental method of breaking down the plant fibers by cooking them, then beating them to form textural sheets. Sometimes fibers are left in their natural form; others are treated with bleach, dye, or pigment. The method of firing Raku offers the potter a spiritual connection and insight into herself and her craft. Totter explains, “Although an experienced potter can predict the outcome of a firing, the excitement of the unknown is always present. Taking a red hot vessel from the kiln with tongs and placing it in a container of straw for a reduction firing, then quenching it with water to retain the copper lusters or gold metallic, is always a moment of wonder and excitement.” These lusters, combined with landscape imagery and textured surfaces all play an important role in the creation of her vessels. The simplicity of form reflects an Oriental influence and there are not two exactly alike. Working in the medium for over twenty years, Totter was a rare and privileged guest of Mr. Raku at his studio in Kyoto in 1978. 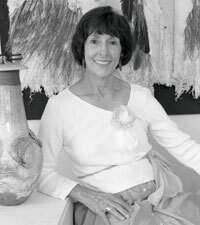 Totter exhibits her award winning work in many galleries and museums and markets her work nationally.